SharePoint Online Explorer view provides great flexibility like Windows Explorer functionality to manage Files and folders. Majority of the usage: drag and drop! Where is Explorer View in SharePoint Online? Click on the View menu drop down from top-right area ( such as "All Documents") >> Select "View in File Explorer" Menu item. >> This opens the document library in explorer view for SharePoint Online. SharePoint Online explorer view not working? or Greyed out? Explorer view is available only on 32 bit version of Internet Explorer! You cannot open in explorer view on Google Chrome or Microsoft Edge browsers. 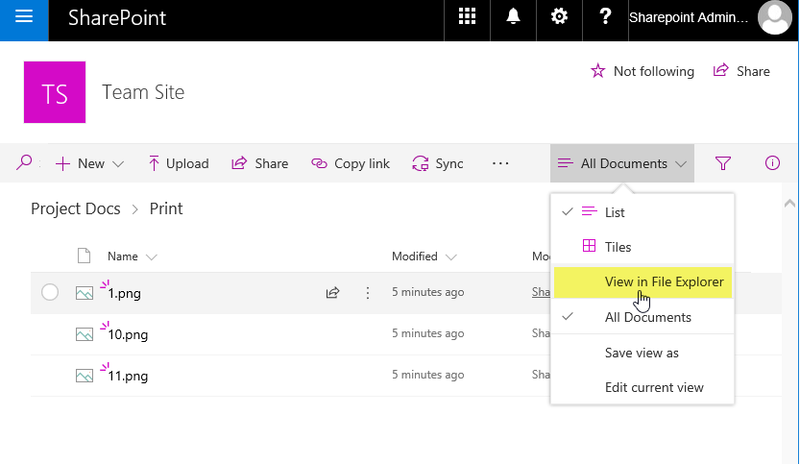 Now SharePoint Online modern document libraries also provides drag and drop functionalities. E.g. Create folders and drag and drop files to it with in browser itself. (You can't drag and drop a folder however!). You can copy/move files within the SharePoint Online libraries using Modern document library user interface.